I am an associate professor (Maître de conférences) at the networks and telecommunication department at the University Institutes of Technology of Béthune, France, and a member of the OptiSco research team of the LGI2A laboratory. We present a simulated annealing based algorithm for a variant of the vehicle routing problem (VRP), in which a time window is associated with each client service and some services require simultaneous visits from different vehicles to be accomplished. The problem is called the VRP with time windows and synchronized visits. The algorithm features a set of local improvement methods to deal with various objectives of the problem. Experiments conducted on the benchmark instances from the literature clearly show that our method is fast and outperforms the existing approaches. It produces all known optimal solutions of the benchmark in very short computational times, and improves the best results for the rest of the instances. 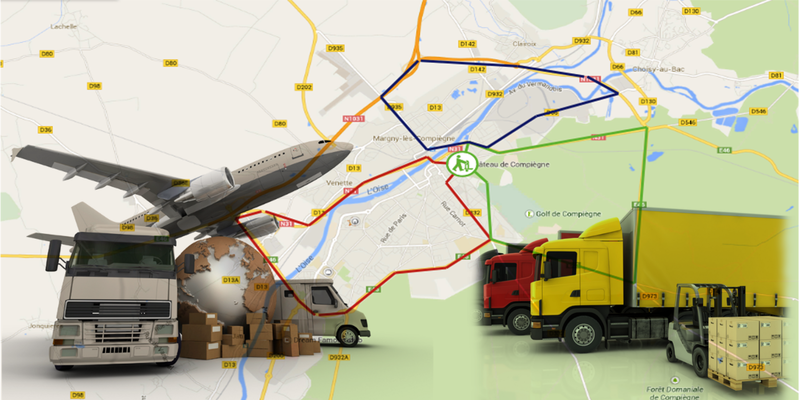 This dissertation focuses on vehicle routing problems, one of the major academic problems in logistics. We address NP-Hard problems that model some real world situations particularly those with different temporal constraints including time windows, visit synchronization and service balance. The aim of this research is to develop new algorithms for the considered problems, investigate their performance and compare them with the literature approaches. Two cases are carried out. The first case studies the Vehicle Routing Problem with Time Windows (VRPTW). We propose new lower bound methods for the number of vehicles. Then we present a Particle Swarm Optimization algorithm dealing with the Solomon objective. The second case studies the Vehicle Routing Problem with Time Windows and Synchronized Visits (VRPTWsyn). Both exact methods and heuristics are proposed and compared to the literature approaches. In Université de Technologie de Compiègne, 2014. Laila En-Nahli, Sohaib Afifi, Hamid Allaoui, Issam Nouaouri, Gilles Goncalves, Cécile Carra. A multi-objective modelling to sustainable vehicle routing problem in home health care services: goal programming approach. In GSC, 2016. Laila En-nahli, Sohaib Afifi, Hamid Allaoui, Issam Nouaouri. Local Search Analysis for a Vehicle Routing Problem with Synchronization and Time Windows Constraints in Home Health Care Services. In IFAC, 2016. Sanaa Lerhlaly, Maria Lebbar, Hamid Allaoui, Driss Ouazar, Sohaib Afifi. An Integrated Inventory Location Routing Problem Considering CO2 Emissions. In Contemporary Engineering Sciences, 2016. Laila En-nahli, Sohaib Afifi, Hamid Allaoui, Issam Nouaouri. Heuristique pour le Problème de Conception des Tournées du Personnel Soignant avec Contraintes Multiples dans les Structures d’Hospitalisation à Domicile. In ROADEF, 2016. Sohaib Afifi, Aziz Moukrim. Une Méthode Hybride pour le Problème de Tournées de Véhicules avec Contraintes de Temps. In ROADEF, 2016. Sohaib Afifi, Aziz Moukrim. Primal Heuristics for the Vehicle Routing Problem with Synchronized Visits. In MISTA, 2015. Sohaib Afifi, Duc-Cuong Dang, Aziz Moukrim. Heuristic solutions for the vehicle routing problem with time windows and synchronized visits. In OptLet, 2015. Sohaib Afifi, Duc-Cuong Dang, Aziz Moukrim. Une Heuristique pour un Problème de Tournées de Véhicules avec Fenêtres de Temps et des Visites Synchronisées. In ROADEF, 2015. Sohaib Afifi. Problèmes de Tournées de Véhicules avec Synchronisation de Ressources. In Université de Technologie de Compiègne, 2014. Sohaib Afifi, Rym Nesrine Guibadj, Aziz Moukrim. New Lower Bounds on the Number of Vehicles for the Vehicle Routing Problem with Time Windows. In CPAIOR, 2014. © 2017 Sohaib LAFIFI · Powered by the Academic theme for Hugo.